Eniac Ventures is the first independent seed stage venture firm investing exclusively in mobile technologies. Eniac Ventures was founded in 2009 on the belief that the greatest technological catalyst of our time is the proliferation of Internet-enabled devices providing constant connectivity to the majority of the world population. Eniac Ventures is named after the world first computer developed at the University of Pennsylvania School of Engineering, where the four general partners met in 1996. We are serial entrepreneurs and operators with over 60 years of combined experience in the mobile software space. We have advised and invested in 150+ mobile software startups. At Eniac we call Nihal the human rolodex, thanks to the thousands of connections he has made with some of world's top companies and brands. He developed many of these connections over the past 20 years while founding five different high tech startups. Most recently Nihal was the founding CEO of LocalResponse, where he grew revenues 2153% in three years and landed them at number 204 in the 2014 INC. 5000�s Fastest Growing Companies. 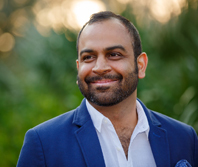 Prior to LocalResponse, Nihal founded buzzd, the first real-time mobile cityguide, and ipsh!, one of the first full-service mobile marketing agencies in 2001, which was acquired by Omnicom (NYSE: OMC) in 2005. Even before founding Eniac, Nihal honed his ability to spot top entrepreneurial talent by investing in Admob (acquired by Google), Swiftkey (acquired by Microsoft), Tala, Tapad (acquired by Telenor), and Uber to name a few. Because of his experience both building and funding top technologies, he frequently guest lectures at business schools around the country on entrepreneurship and mobile marketing, and is published in over 15 books and white papers on the subject. Outside of the office Nihal loves to spend time with his wife Reshma and is a big supporter of her non-profit Girls Who Code. Around town you will usually see him with his son Shaan and beagle-bulldog Stanley. Nihal is the life of the party, which is why he always spearheads Eniac events. Nihal graduated from the University of Pennsylvania with a BA in Philosophy and a BSE in Computer Science. Airbnb is a website for people to rent out their properties. BetterCompany is a safe place that surfaces key workplace issues, opinions and topics while fostering healthy conversations. Biobeats builds technologies that respond to physiologic data and learns how users interact with them. Boxed is a discount wholesale shopping app. To list your Company on our website and make your profile available to Nihal and 7,500+ other VCs and Angel Investors, Click Here.